The concept behind my ceramic forms originates from the idea of combining ancient and modern architecture. This idea explores how architectural design involves the manipulation of mass, texture, space and materials to create a functional and aesthetic structure. The architectural system the Ancient Greeks used led me to investigate this idea. 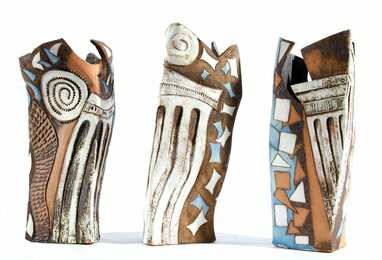 My ceramic forms were based on the Doric, Ionic and Corinthian orders, each having their own distinctive proportions, and detailing this concept was created using surface design taken from aspects of each order, as well as incorporating modern architectural design and blue and green colours to achieve this contrast between both.